We are very proud that our fishing methods are some of the best, most professional, and most studied in the world. Our gear is exclusively hook and line. Our methods ensure both a high quality product and a sustainable resource. As you can see from the following publication, it has been our pleasure to work with Oregon State University Sea Grant to help get basic information about the fishing industry out to the public. Our crab fishery is in the process of obtaining the Marine Stewardship Council's coveted eco-friendly, sustainable fishery certification. 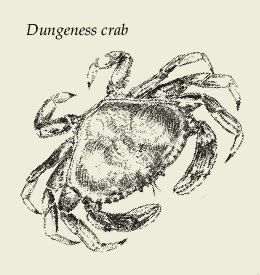 Dungeness crabbing is seasonal, usually from December 1 to August 15. The majority of the catch occurs during the first two months of the season. Most vessels participate in a combination of other fisheries during various times of the year. 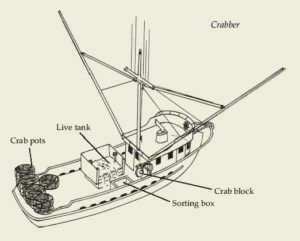 Crabbers are rigged with a large hydraulic block (crab block or gurdy). Mounted just behind the pilot house, it is used to haul in pots. Because the catch is delivered to the market live, the vessels have a circulating seawater system in their holds. Most pots are circular, measure three to four feet across, and weigh from 75 to 120 pounds.